Southgate Recycling was started by Keith Walters under his existing Environmental landscaping and consulting business E-scape Environmental Services in January 2010. After realizing that he could not successfully manage two businesses, Keith asked his long time friend and fellow Springbok Scout Gavin Paulsen to join him in his new business venture. Gavin left Subaru Durban where he was employed as workshop manager in May 2010 and joined Keith. Neither Keith nor Gavin had any plastic processing experience, but were enthusiastic to learn new skills. Second hand processing machinery was sourced and commissioned, and Keith's existing landscaping staff was offered the opportunity to join the new business. Four permanent staff members were appointed and moved across to begin learning the business alongside Keith and Gavin. Southgate Recycling focused primarily on toll converting of production waste LDPE, HDPE, PP, and PVC for a number of clients. Through trial and error, some difficult to process waste plastic products were successfully recycled for our clients for the first time despite many others trying. A great deal of experience has been obtained through Keith and Gavin’s “hands on” approach and Southgate Recycling has become well established locally as a quality service provider. They currently employ 8 permanent staff. Southgate Recycling is always looking for opportunities to expand the business into new markets by adding value to their product range. They have recently developed a method of utilizing waste rigid PVC and converting it into a woven lattice for fencing/screening applications. It was originally intended for fencing in coastal dune rehabilitation projects undertaken by Keith’s sister company E-scape Environmental Services. A large demand for this product has also emerged from the domestic market for DIY garden screening, edging, outdoor furniture and decoration. Southgate Recycling started out as a waste plastic recycler and converter. The business has evolved a great deal since it first begun. We no longer pelletize and sell on plastic material but now extrude it directly into usable profiles such as our planks, fencing and garden edging. 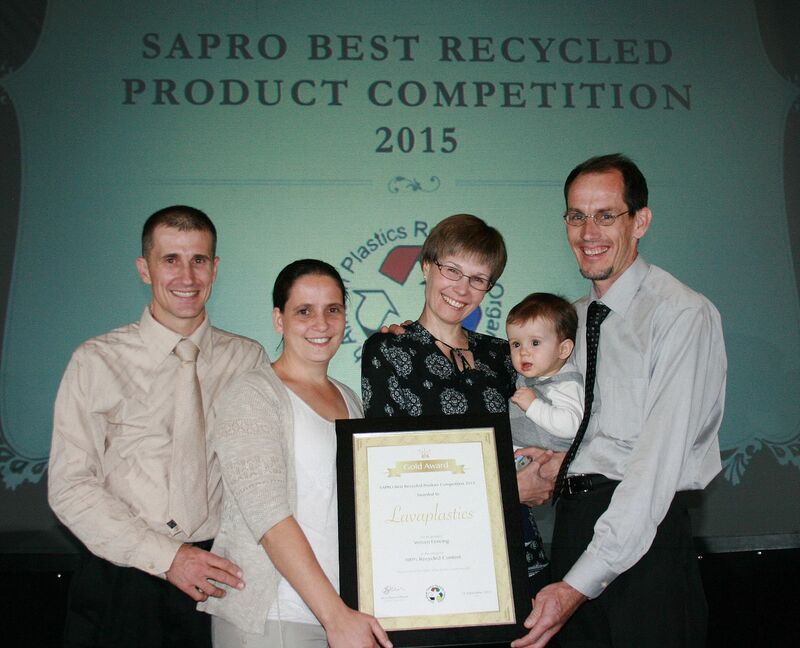 Southgate Recycling recently entered into the 2015 SAPRO “Best recycled product of the year” awards, and walked away with a gold award for their recycled plastic fencing in the 100% recycled content category.